Today I've managed to get my hands on a paintbrush so I'm using Lumiere paints again. I can tell you that it's sooooo much easier to use a brush than it is to use a tissue. But still, I can only use the materials I have on hand. The colours I have are Halo Pink Gold, Halo Blue Gold and Bright Gold. Hmmmm..... not the colours I would choose to combine if I was in my studio, but I'm not, so that's what I'm going to do. One of the qualities I like most about Lumiere paints is that they blend so easily into each other so that the colours just gradually move from one colour to the next without a seam. I painted the front section of this bangle with Halo Blue Gold and then blended Bright Gold into the wet edge on the right hand side. You need to work quickly because you don't want the left hand edge to dry or it becomes difficult to blend in the last colour. 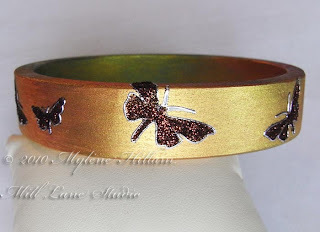 Next I blended Halo Pink Gold back into the Bright Gold and continued in this fashion around the outside of the bangle. I did the same on the top and bottom edges. I left it to dry for a while before I coloured the inside in the same way. When I'm teaching this technique in class, I always stress that you only need a light coat of paint or it will take too long to dry. You can always come back and paint a second coat if your coverage isn't dark enough. 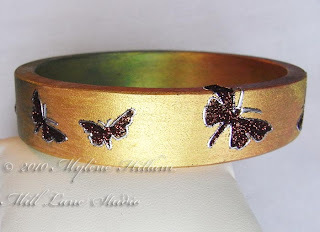 I used silver peel off butterflies from Magenta as the embellishment on the bangle. 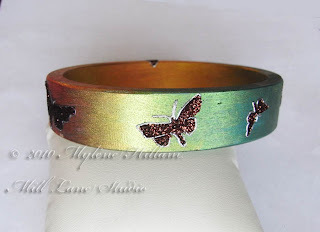 The silver is an unexpected contrast here but even more so when it's filled with dark chocolate coloured glitter from Art Institute Glitter - together they add quite a bit of punch to the bangle. 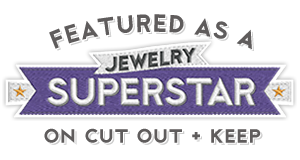 Today's thank yous go to Jacquard and Art Institute Glitter for generously supplying the products for this bangle. 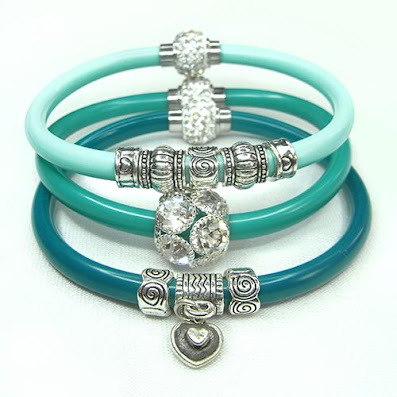 And of course Diy Bangles for supplying the oval shaped bangle.